Secret Ravine Vineyards is a family-owned operation featuring fine wines made from locally grown grapes. We strive to capture the unique characteristics of the foothills. The vineyards we manage in the Loomis Basin provide us with different terroir which in-turn produces unique flavors similar to Southern France and Northern Italy. Our award-winning wines includes Cab Franc, Montepulciano, Teroldego, Tannat, Zinfandel, fantastic blends and more. 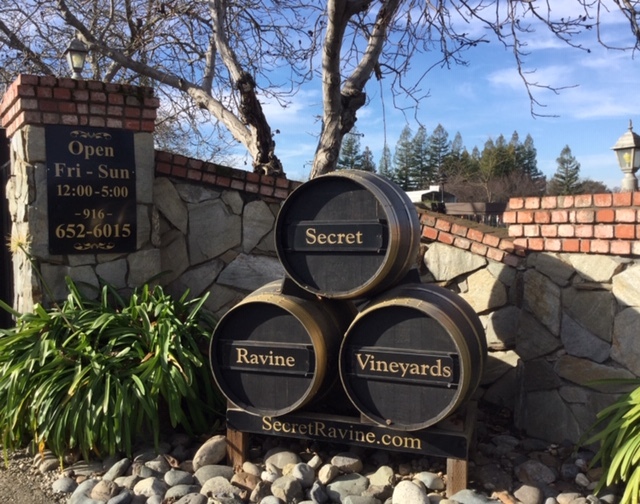 Secret Ravine Vineyards, was founded in 1998 because of Ron and Vicky Morris’s appreciation for wine. A family owned company with the objective of producing “Fine Wines from Locally Grown Grapes”, wines that you would enjoy with your evening meal and to share with family and friends. Our principal focus is in producing quality grapes from the 15 acres of vines we farm utilizing sustainable viticulture practices to maximize full varietal character of the grapes whose origins spring from regions similar to the Loomis Basin. The character and quality of our estate vineyards is achieved by approaching each vineyard site differently, harvesting when the grapes have reached full physiological ripeness. The wines are blended and barrel-aged in American and French oak for a minimum of two years resulting in fruit forward flavors with unique barrel accents. Twenty years later, we are still committed to making wines of quality and distinction at Secret Ravine Vineyards. Come visit, we are conveniently located only minutes off I-80.